I recently returned from a trip to Punta Cana…I know…lucky me. Believe me, I’m still pinching myself! It was a 25th wedding anniversary gift to ourselves and we had a blast! A trip like this gives me a head start on my spring and summer sewing and I knew that Fabricville’s selection of rayons would be the place to start….my absolute favorite of all fabrics and perfect for hot, humid weather. If you follow me regularly, you probably already know that I a love navy blue and white color palette and this tropical print was perfect. It also has a bit of lavender in the print which is so pretty. 1. Wash and dry your rayon( also known as viscose) fabric prior to cutting out your pattern…treat it as you would later treat the garment. It can tend to shrink and no one wants to spend the time to make a beautiful dress only to have it not fit after the first wash! 3. Use sharp scissors or a rotary cutter to cut out your pattern, being careful not to let it shift around. 4. Handle your pattern pieces carefully, rayon can stretch easily and if handled roughly, you may find it difficult to match your pattern piece notches. 5. Finish your seams with a zig zag stitch, serger or with a french seam. Rayon has a tendency to ravel if you don’t. 6. Before hemming, allow your garment to hang. Sometimes after hanging it on a hanger for 24 hours, the hem will have shifted and will be uneven. This is not a big deal but it will have to be evened out before you finish. 7. My last tip is one that use often when hemming the bottom or sleeves of a rayon garment. If let’s say…. a dress has a 5/8 inch hem allowance… I will sew a line of stitching 5/8 inches from bottom and use this line as my guide when pressing my hem up before stitching. It acts like a perforated fold…and the stitches also act as stay stitching to prevent the hem from stretching. Whew! I had more tips than I realized! Of course this may not be all of them and if you have any to add, please do so in the comments. I always love to hear new tips from fellow sewists!! My pattern choice is a new favorite! M7534 is fitted wrap bodice with sleeve and length variations. For a wrap bodice…which I really like…this is one of the best. The reason is that it doesn’t gape open in the front. It has the best fit for a wrap bodice that I have ever made. I decided to make a sleeveless version of View D and added inseam pockets. I think that this pattern a great one and I love the long sleeve version as well. So…have you begun your spring/summer sewing? If so, will rayon/viscose be a choice for you? I hope you give it a try and that my tips will make it a bit easier. And don’t forget to share yours! * Margo is a fabric addict and pattern hoarder extraordinaire, and attempts to justify it all on her blog, Creating In The Gap. 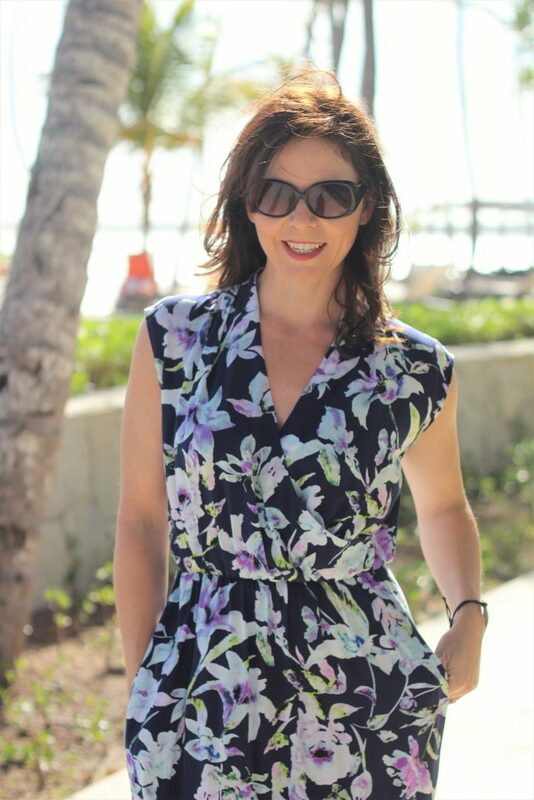 Love the tropical dress…and can use a vacation down south just about now! :). Thank you Helena! After a Canadian winter, we could all use a trip south! I had no reason not to be happy did I!?? Thank you Almeda!!! Where did you get pattern ? Hi Rita. I got the pattern at Fabricville. Hi, does your beautiful dress have a zipper? Does it wrinkle badly? Thanks Eleanor ! This dress doesn’t have a zipper and though rayon does wrinkle, I find that they fall out quite nicely. And they aren’t very noticeable in a print! Oh, now that’s a great tip about sewing the hemline before folding it up! Thanks Margo. My last rayon make shrunk after I made it…sigh…and that was withe a pre-wash. I think next time I will pre-wash it in hot water twice before cutting. Hi and thanks a lot for sharing your tips. The dress is gorgeous!